Well I finally made it to Dublin after my flight was rerouted to Atlanta from Cincinatti. I arrived about 9:30 a.m. and caught the 41 bus which went straight to my hostel. Unfortunately, check-in was not until 2:00 p.m. so I walked around until then. 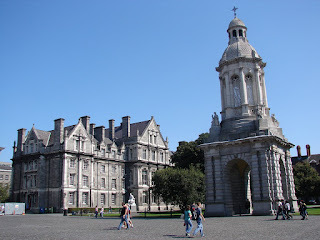 First I went to Trinity College to see the Book of Kells. This book was written by Scottish monks in the 8th century. It is in latin and represents the 1st 4 books of the new testament. The pictures and artistic writing are unbelievable and I cannot imagine how much time it took to create that much detail. Google the Book of Kells if you get a chance. I then went to the Long Room which is their library and home to over 700,000 books. Most of them are over 400 years old and in latin. By this time it was well after 2:00 so I checked into the hostel and caught a few hours sleep. 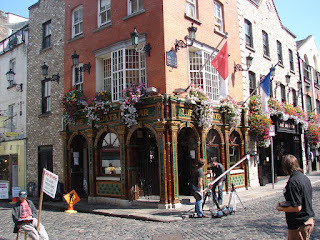 When I woke up I went to the Temple Bar which is Dublin's equivalent of the French Quarter. 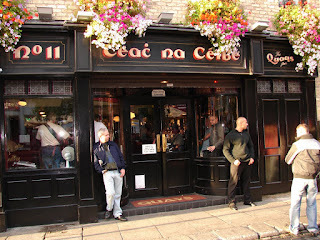 With over 1000 pubs in Dublin, I do not see how they get any work done. I found a nice pub with original Irish fok music and ordered my first Guinness. It is very dark and takes several minutes for it to settle so that you can drink it. It was quite bitter but by the second pint I could see that this could become an acquired taste. I met two girls from England and we tried several other Irish beers and Jameson whiskey. One of the English girls was drinking Jameson and lemonade. Tasted pretty good. I was told by an Irish woman on the plane that I would probably spend a lot of my time in the pubs while in Ireland because that is where the Irish spend their time. I can see that now. The Irish like to go to the pubs and have craic. The first time I heard that I was a little surprised and then I learned that craic is good conversation and a good time.